I’m curious as to where you found your Eva? You can pm me if you wish to keep it private. 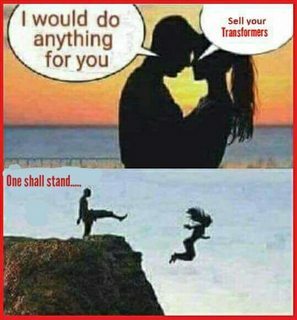 As for my wife I just send her this when she says no more transformers. PM'd you on the EVA. Haha that's a classic, not sure I'm game to use it though. I got my complete set (minus the Leader) of Wave 2 POTP toys from TLTC today. I'm a little disappointed by several or the moulds though. this thing is freaking huge and looks amazing. Sludge and Snarl turned up early this week to finish my POTP Dinobot set! Excellent. Also had Darkwing and Battletrap in the same parcel, from the excellent thelittletoycompany. Today I've got a Hun-gurrr. TLK Cogman arrived from ebay today.